Some information is too important to be allowed to wear away. Safety diagrams, instruction labels, ID plates – these things need to match the lifespan of the product they’re attached to. If you’re looking for an option that offers longevity and durability, consider using photo-sensitive metal solutions for you labels or ID plates. You can opt for photo-sensitive metal labels for purely because you like the way they look. 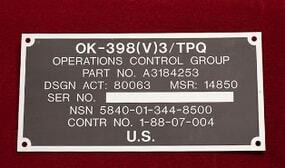 However, there are situations in which a photo-sensitive metal labels or nameplates are the ideal choice. If your photo-sensitive metal labels need to withstand heavy use or resist a harsh environment, then photo-sensitive metal solutions is the smart choice. Industries that require photo-sensitive metal labels include medical equipment manufacturers and the military component manufacturers. We have the capabilities to create photosensitive metal labels and imprint images on one or both sides of a metal sheet. Using a die cutting machine or CNC machine, we can size labels to match your specifications. A variety of adhesives are available for use with metal photo products for your photo-sensitive metal solutionis as well. Sine-tific Solutions has the knowledge and industry experience to help you create a photo-sensitive metal solutions photo product that matches your vision. We can assistance you in selecting the optimal materials, adhesives, and finishes for your photo-sensitive metal labels project needs. Please check out our Art Acceptance Guidelines in order to prepare your working files for production. Contact Us today to get started with your photosensitive metal product order. Sine-tific Solutions uses state-of-the-art equipment to produce high resolution images for photo-sensitive metal label applications. With photo sensitive metal labels and photo-sensitive metal solutions, we can create a variety of industrial and commercial products with true photographic quality. We can even produce pictures on metal to create unique keepsakes and gifts. Contact Us to get started with you photosensitive metal labels order, or request a quote today.